Paul Dunn, Sarah Orenstein, Caroline Gillis, Richard McMillan, Eric Goulem, and Claire Calnan in After Akhmatova, opening tonight. Photo by Cylla von Tiedemann, courtesy of Tarragon Theatre. In today’s Urban Planner: check out an urban-focused reading series, learn to use the internet For Good, attend what is most certainly Not A Reading Series, and catch the opening night of a play about a woman who wrote a poem about her son—but it’s really about Stalin. READING SERIES: World Literacy Canada and the Centre for City Ecology host Cities, part of World Literacy Canada’s KAMA reading series. Architect, teacher, and author Ken Greenberg will moderate a discussion with Suketu Mehta, author of Maximum City: Bombay Lost and Found, and Doug Saunders, author of Arrival City. The Park Hyatt (4 Avenue Road), 6:30 p.m., $60. TECH: Technology crusaders Free Geek Toronto, an organization promoting fair and equal access to computers and the internet, offers an introductory course in Linux to help participants get acquainted with this family of open-source operating systems and the movement behind it. Free Geek Toronto (51 Vine Avenue), 6:30 p.m., FREE. COMICS CABARET: In celebration of Feathertale‘s first full-length comics issue, the magazine and publisher is partnering with This Is Not A Reading Series to throw a launch party the likes of which you’ve likely never seen before: live jazz from Iain Marlow and the Subordinate Clause, regular Feathertale contributors performing short stories and poems, a Comic Idol showdown, and an onstage creation of a comic strip. The Gladstone Hotel (1214 Queen Street West), 7:30 p.m., $5. 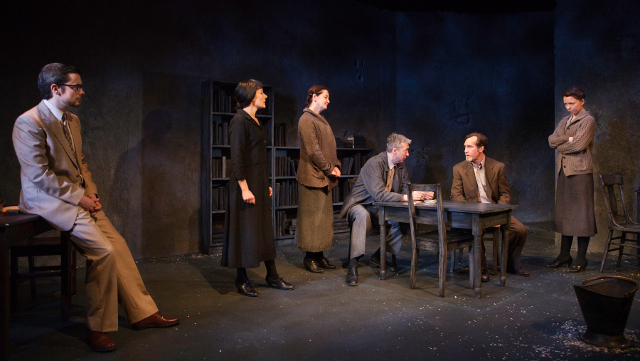 THEATRE: Kate Cayley‘s After Akhmatova opens tonight at the Tarragon Theatre. A Russian man is interviewed by an American academic about his late mother, Anna Akhmatova, a poet who wrote an ode to her imprisoned son in which she condemned Stalin’s rule. Tarragon Theatre (30 Bridgman Avenue), 8 p.m., $23–46.